Here’s a few notes from my first day at the 2011 Nashville Amp Expo. First of all, I didn’t take any pictures because…well, there’s no excuse for that. But wherever possible I will include images from the web of the gear I’m referring too. 2 years ago, at the very first NAE, the first room I visited was the Samamp room. That’s where I found the VAC 23 combo that I’ve been using ever since. Sam Timberlake, the owner and builder of Samamp amps sent me one right after the show, and I knew within about 5 minutes that I was going to buy it. This year Sam had a brand new amp. The amp is a 2 channel amp, with a very unique overdrive channel that sounds much better than most preamp overdrive channels I’ve played through. It sounds fantastic. The clean channel is very much like my VAC 23, but the overdrive channel adds so much flexibility. 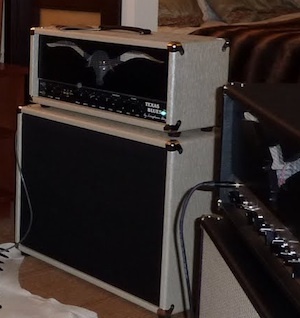 There’s too many details to write here, but I’ll be doing a demo of this amp in the future. 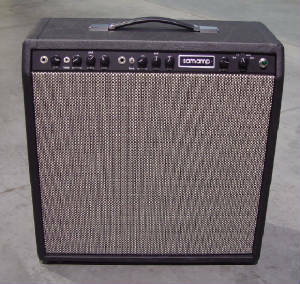 If you’re thinking about getting a Samamp, this is one to look at first. Late last night after the crowd had thinned out, I got a chance to try the Wampler Ego Compressor pedal. For whatever reason, there has never been a compressor pedal in my gear collection, but that may change. Part of the challenge of playing through squeaky clean amps is the lack of sustain at low volumes, especially with heavy strings and a strong picking attack. When an amp is not distorting, those initial pick attacks are very prominent, they stand out much more than the sustained note as you hold it. So unless you’re playing at really high volumes, this drop off in volume makes your tone feel underwhelming and a bit plinky. This is where a compressor can help. Compressors basically squash the initial attack and keep the volume more consistent so your sound feels fuller. But I don’t want a pedal that completely squashes that initial attack, I just want something that helps the rest of the note to sustain longer. 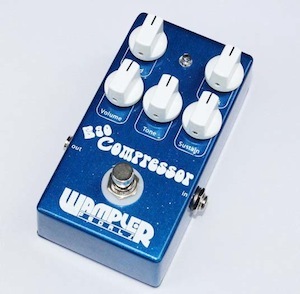 The Wampler Ego Compressor has a blend control which allows you to blend the original uncompressed signal and the compressed, more sustained signal from the compression circuit. So you get the best of both worlds, crisp attack, and longer sustain. I met David from WGS at the NY Amp Show a few months back, but didn’t have a chance to try out either their 15” speakers until yesterday. Comparing speakers is one of the hardest things to do unless you can switch between them quickly. That’s why these shows are probably one of the best ways to compare speakers, no volume restrictions and very quick switching between different models. David told me the story about how WGS transformed from a behind-the-scenes OEM speaker manufacturer, to a branded speaker manufacturer, and it’s a fantastic story. Long story short, a huge OEM order fell through, and rather than throw away thousands of speakers, David started selling them on eBay for cheap, they got fantastic user reviews and the rest is history. Longhorn Amps is a fairly new name in the boutique amp market, but they got some terrific reviews from players at past events. While attending NAMM in January, Harold Henkel told me it was the best sounding amp at the LA Amp Show. Terry, the builder, designed the amp to try and capture Stevie’s tone, so of course, I was very interested in seeing what it could do. And, it’s great. It’s also quite expensive. Terry told me that he considers this amp his signature amp, with all the bells and whistles he could put in it. And trust me, there’s a lot. Some of it is too technical to explain here, but the bottom line is this. If you’re a player in search of that SRV Dumble-esque tone, and price is not a concern, you should find a way to try out this amp. 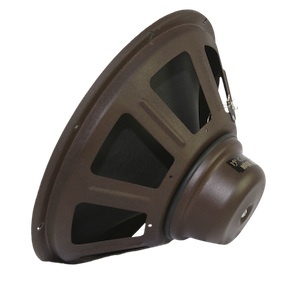 There are many ways to get good tone at low volumes. But until now, almost none of them had anything to do with the speaker. Enter FluxTone. 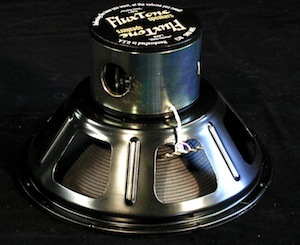 Using the magic of electromagnetics, a FluxTone speaker has an attenuation control that weakens the magnet of the speaker with electrical signal. This makes the speaker less efficient, making it quieter. I was skeptical. But as another show attendee played, I put my ear right in front the speaker, listening carefully for any changes in tone as the speaker control was adjusted from loud to quiet. It was like magic. Any changes in tone were subtle, and it’s important to realize that our ears ‘hear’ differently at quiet and high volume levels. Here’s the catch. These things are not mass-produced (yet), and as a result, are very expensive. It’s a chicken-and-the-egg thing. They can’t come down in price until they’re mass produced, they won’t be mass-produced until there’s a ton of people buying them, but most people won’t buy them until they’re cheaper. Assuming that prices will drop eventually, it’s hard for me to imagine a future where you won’t see these, or something like them, everywhere you look. Part of my trips to Nashville include chatting with Josh from GuitarLifestyle.com. I’m not an avid blog reader, but I do check Josh’s blog because he finds stuff, like these rare SRV soundcheck videos, that I would never find on my own. I always enjoy talking with him because, all guitar talk aside, he’s a huge computer nerd like me.